LONDON (AFP) -- A London auction of music legend David Bowie‘s art collection has ended with sales totaling almost 33 million pounds ($41.5 million), after exhibits of the works drew record crowds, Sotheby’s said Saturday. Sales of works by Damien Hirst, Henry Moore and Marcel Duchamp among others totaled 32.9 million pounds, Sotheby’s said. 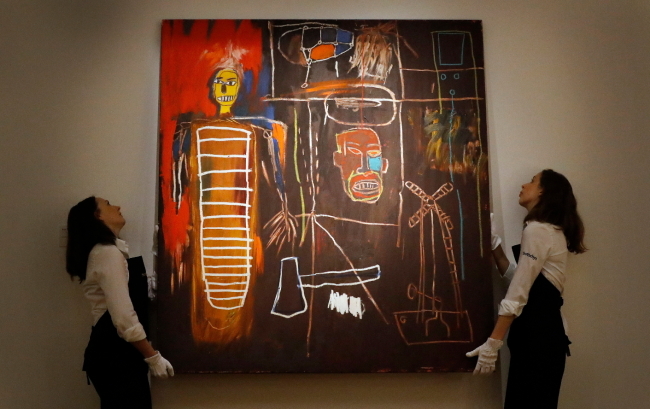 The highest-selling item in Bowie’s collection, the graffiti-inspired “Air Power” canvas by Basquiat, sold for 7.09 million pounds. It had been expected to fetch between 2.5 million pounds and 3.5 million pounds. New records were set for more than half of the artists represented in the “White Glove” sale of Bowie‘s works, according to Sotheby’s. Frank Auerbach’s “Head of Gerda Boehm” sold for a record 3.8 million pounds.